I first got to know Mr. Calabrese, who I later came to know as Jim, as a 6th grader at Greenville Elementary. He had come to Monroe County the year before and started building a Band at Union High School, with a foundation left by Mr. Chuck Dryden the previous Band Director. Jim had come to us from North Carolina. He already had a long list of accomplishments when he got to us, from bands he had directed in Southern Virginia and North Carolina. I digress, first a little background. When Jim came to us, the UHS Band had only a handful of students at the high school; and beginning programs at Greenville and Gap Mills Jr. High Schools, and Greenville, Gap Mills, and Union Elementary schools were not very strong. Immediately Jim got to work and started talking about Band and not just any Band but a great UHS band (combined with GJHS and GMJHS). It was evident that this was not just any ole band director. Jim was energetic and passionate about music and band and had the credentials to back up what he was talking about. Jim’s wife was a native Monroe Countian whom he had met while attending Concord College some years earlier. The couple had a son, and a daughter Susan, who was just a year older than me, Together, they made an immediate impact on the county.I was recruited to play trumpet, and with the use of the county equipment, which was not in the greatest condition, he undertook the daunti ng task of teaching a semi- tone deaf young lad to play the trumpet. At the same time he had recruited a number of High School, Jr. High and Elementary students too. So the man must have worked endlessly in teaching so many youngsters to play an instrument. It was not long until not only were people talking about the football or basketball team, but they were also talking about the Band. 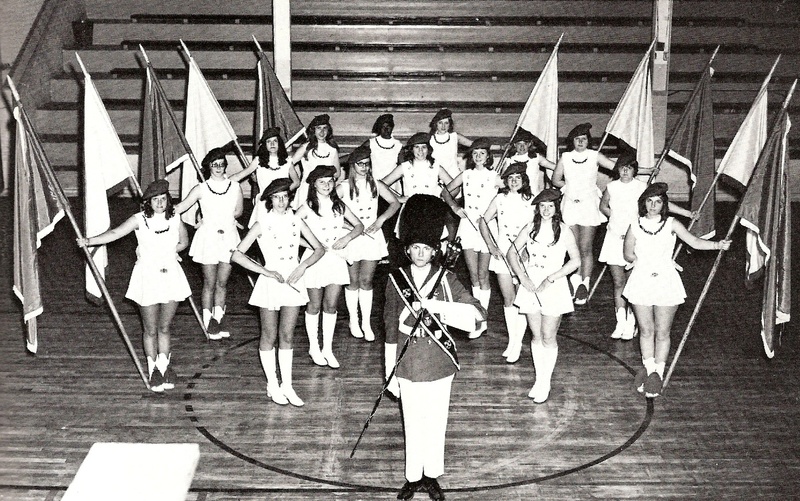 By the spring of 1973, UHS Band was getting some real attention in the area and even Greenbrier East (which was said to have one of the best bands in WV at the time) was beginning to take notice. 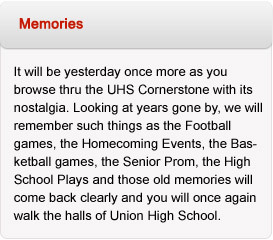 At Spring Contest, UHS Band did something not done by any band at the time and maybe not since. They went to Bluefield and scored a perfect superior rating. An awesome feat by anyone’s standard. The band grew and so did its reputation. It was about this time that Mr. Calabrese decided that I was big enough to play the Sousaphone, i.e. Tuba. The Band had grown to over 65 members and this allowed for four Tubas. It was Alvin Phillips and Bill Guy’s job to keep me in step. They did a pretty good job. The year 1974 also saw the addition of the Timpani Cart. This cart was Mr. Calabrese’s design and built by Mr. Charles Larew, UHS Vocational Agricultural and Shop Teacher, before school started in the fall of that year. This cart was designed to carry two large Concert Timpani, aka Kettle Drums, and one rider who played the drums. It was pulled through the parade or half-time show by two band members. This added a whole new dimension to our band. I have not seen one of these before or since. 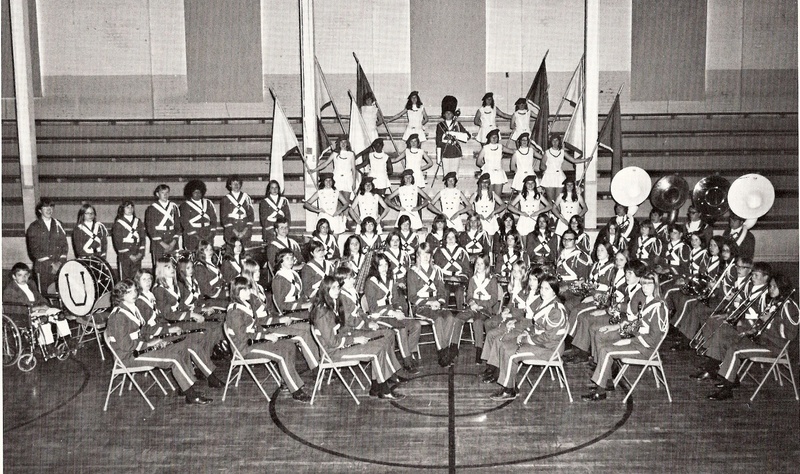 Now led by Drum Major Terry Pritt and under Mr. Calabrese expert guidance, we set our sights on the Dogwood Festival in Statesville NC in April of 1974, but first we had to get thought the Fall of 73. Fall brought football and the Band went to every game where they were met enthusiastically by both home and visiting team fans. During half time, the stands stayed full until the UHS Band had left the field, On some occasions visiting fans would arrive early just to watch our Band warm up. At one particular away game in a town with a reputation of not being the best of hosts, we were asked to leave after third quarter. This was a little odd, but it was explained that we were the first band not to be run out of the place by half time in a long time. Christmas came with a concert that saw the Union Gymnasium bursting at the seams with people to hear the Band. Then came basketball season, and again the Pep Band played at all home games and even traveled to many away games. Then it was April and endless marching practices getting read to go to the Dogwood Festival. It had been an unusually warm spring and Mr. Calabrese was busy preparing a bunch of country kids to brave the heat and excitement of competing against some of the best bands in the East and South, if not in the entire United States. He also was preparing us for the HOT weather that awaited us in Statesville North Carolina. The trip to Statesville started well before daylight. For many of us, this was the first trip out of the area, let alone to North Carolina. This trip which is a breeze now via I 77, was long along Old US Rt. 52 in 1974. I think it took us 5 hours or more to get to Statesville at that time, maybe even longer. Especially daunting was the trip down Fancy Gap Mountain to Mt Airy on curvy and steep US 52. The trip took us near Pilot Mountain, which was an awesome sight to many of those on the buses. Following the busses were a number of parents, including Leonard and Nadine Houchins who were taking there youngest son Tommy Houchins to the festival as part of the UHS Band. Tommy suffered from Muscular Dystrophy, an affliction that had claimed his older brother Mike a few years earlier. When Mr. Calabrese came to the county, he wanted to include everyone in the band, so it was that he taught Tommy to play the drums. Only a 7th grader at Greenville Jr. High, Tommy was already wheelchair bound by this time. So with a modified golf cart, Tommy “marched” with the band. I said earlier that I believe that Mr. Calabrese not only impacted lives but also in one case prolonged a life. It was Tommy who found his passion with the drums and played them relentlessly for many years afterward and on into his adult life. Tommy went on to complete college, something unthinkable with someone with his prognosis. He not only graduated from Concord College, but was also a member of the Commanders. The very same organization that Mr. Calabrese was such a major part of just 20 years earlier. It was the drums and the exercise that Tommy got from playing them that was largely credited with slowing his muscle deterioration and prolonging his life to 26 years. Now back to the Dogwood Festival. I am not sure how many bands were there, but it was a very large number. 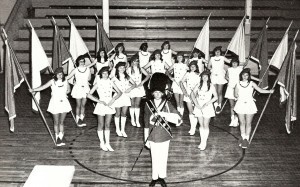 Bands were broken down into categories, based on size A, B and C. We were in class C being one the smallest bands there with approximately 85 to 90 members. I vividly remember seeing a thermometer reading 88 degrees. Some told me they saw one that said 92. Whatever the case it was HOT. During the parade a few band members started to succumb to the heat. I saw one majorette and at least one band member pass out. Mr. Calabrese was prepared. He had already worked out what to do if this started to happen and these members were gently removed with out anyone noticing. Dr Guy, Dr. Hansbarger, and Nursing instructor Mary Bennett were also walking along with the band and were there to tend to those member who needed them. People along the route told us later that we outplayed bands twice our size. Also that our formation was perfect. Little did they know that we had lost a player or two during the parade. Musselman High School was the only other band from WV there if I recall correctly. They were from Bunker Hill in the eastern panhandle and were largely known as the best band in WV at the time. I remember seeing them load their bus and leave immediately after the parade. We were told later that we had actually came in 2nd place overall, being beaten by only thee points to a band from Maryland marching over 300 members. I think that band was a National Award winner. So tiny Union High School from “little ole Monroe County WV” had pulled off the impossible. The trip home was long but very joyous. When the Band got back to the State line they were greeted as heroes, starting in Peterstown and all the way to Union, where a rowdy crowd awaited the band, even though it was well after midnight. 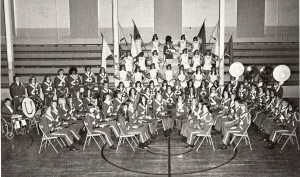 Also, 1974 saw the band performing at the WV State Fair on Governor’s Day, and more accomplishments and accolades rained down upon the Band as Mr. Calabrese worked to make the entire county’s music program flourish. This included anything he could do to help the Peterstown High School Band as well. Unfortunately Mr. Calabrese was only here for three years before he returned to the North Carolina to continue working his magic there. The day he told the Band he was leaving, there was again not a dry eye in the place. It was a very hard thing to hear. But just because he left did not mean he had forgotten us, nor us him. He returned from time to time, and just a few years ago came back to judge Farmer’s Day floats. Some former band members organized a Reunion Band in his honor, and he once again lead the UHS Band through the Parade. I talked to him over the years and he expressed his fondness for all those he became friends with in Monroe County and especially all those who had supported the band. To a lot of folks in Monroe County, he was an awesome band director, a friend, and an all around great man. He will be missed by many.